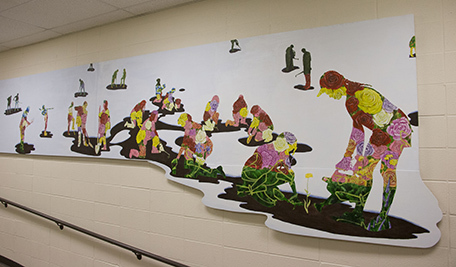 A new mural, “Constructive Resilience,” located in the Building C hallway, honors the efforts of diverse community members to create bonds of friendship. A dedication is planned at 3 p.m. in the Scot Room and 7 p.m. in the Bersted Lecture Hall, Room A240 on Thursday, Nov. 8. The dedication will include a showing of the film that inspired the mural—“Changing the World, One Wall at a Time.” A discussion and viewing of the mural will follow. McHenry County College (MCC) will dedicate a new mural, “Constructive Resilience,” honoring the efforts of diverse community members to create bonds of friendship at 3 p.m. in the Scot Room and 7 p.m. in the Bersted Lecture Hall, Room A240 on Thursday, Nov. 8. The dedication involves a showing of the film that inspired the mural—“Changing the World, One Wall at a Time,” a documentary about the world’s largest street art and human rights campaigns. A discussion and viewing of the mural will follow. “The art raises awareness about educational discrimination, which considers the unique issues in various countries and local communities,” said Pat Gaughan, adviser for the Student Peace Action Network (SPAN). In 2017 SPAN sponsored a showing of that film and students soon planned the mural. Several MCC groups collaborated on the project, including the Student Peace Action Network, Black Student Union, Multicultural Affairs Office, and the Horticulture Department. Community collaborators included Continuing the Conversation on Racial Healing (CTC), and Faithbridge. Faithbridge provided the funding for the mural. In the series of conversations held by Continuing the Conversation on Racial Healing last spring at MCC, participants were welcomed to volunteer to be a part of the mural. These individuals were photographed in gardening poses and their silhouettes used in the mural. These racial healing dialogues have expanded to include two dialogues at MCC. Anyone who is interested in being a part of these dialogues, contact healing.racism.ctc@gmail.com. Artist Laura McLuckie-Khandan’s vision for the mural was inspired by the metaphor that we are all like flowers of one garden. “Through the metaphor of a human garden, the mural unfolds a story of the disintegration of antiquated, societal perceptions, and the integration of the understanding of the oneness of humankind” McLuckie-Khandan said in her artist statement. This event is free and open to the public. For more information, contact: SPAN adviser Pat Gaughan at pgaughan@mchenry.edu. McHenry County College will dedicate a new mural, “Constructive Resilience,” honoring the efforts of diverse community members to create bonds of friendship at 3 p.m. in the Scot Room and 7 p.m. in the Bersted Lecture Hall, Room A240 on Thursday, Nov. 8. The dedication involves a showing of the film that inspired the mural—“Changing the World, One Wall at a Time,” a documentary about the world’s largest street art and human rights campaigns. A discussion and viewing of the mural will follow.